Who is my DeKalb County Commissioner? How is my Property Zoned? - How do I find the zoning of my property? What questions should I ask during zoning? Understanding how your property and nearby properties are zoned is extremely important. This information can help you understand how your neighborhood could be affected by a new development. In this section, we’ll look at zoning elements at the most local level and discover why these simple things can make a big difference in your neighborhood! How do I find the zoning of my property? DeKalb County has a very intuitive GIS (Geographic Information System). 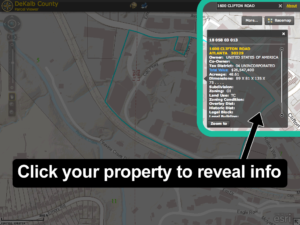 This advanced mapping system is loaded with property information for the entire county which Planning Department and other government officials use to search & determine zoning, land use, acreage, property values and other information. 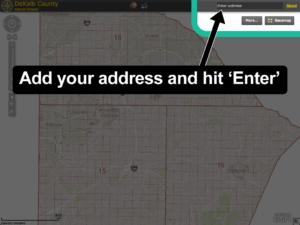 You can use the GIS system to search your home address and discover your zoning! DeKalb County has a very intuitive GIS (Geographic Information System). 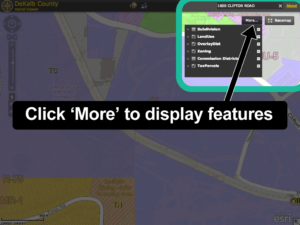 This advanced mapping system is loaded with property information for the entire county which the Planning Department and other government officials use to search & determine zoning, land use, acreage, property values and other information. 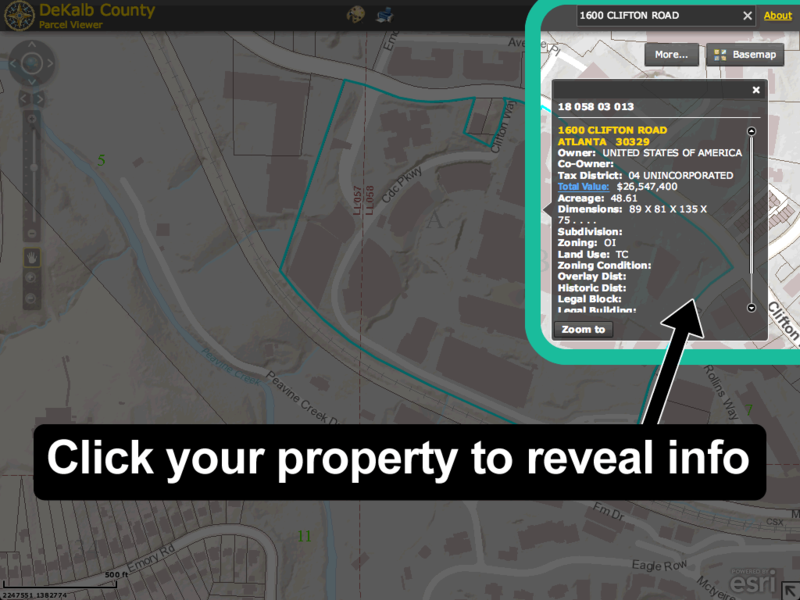 You can use the GIS system to search your home address and discover your zoning! In the top, righthand corner, you’ll see a search bar. 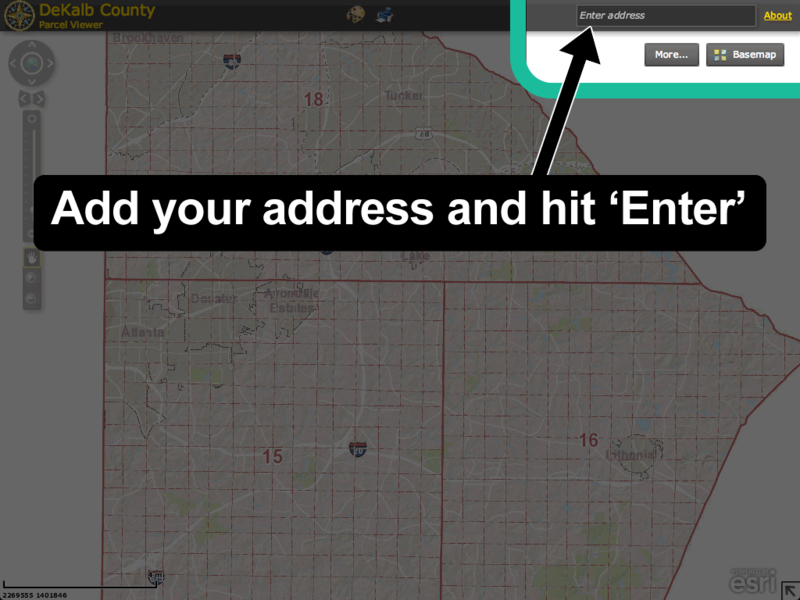 Add your address and hit ‘enter’. You can also zoom in using your mouse wheel and scroll around to your area. You can choose several options to show or hide on the map. This is helpful when learning about other properties around you. Take your time and get to know how these other properties are zoned. 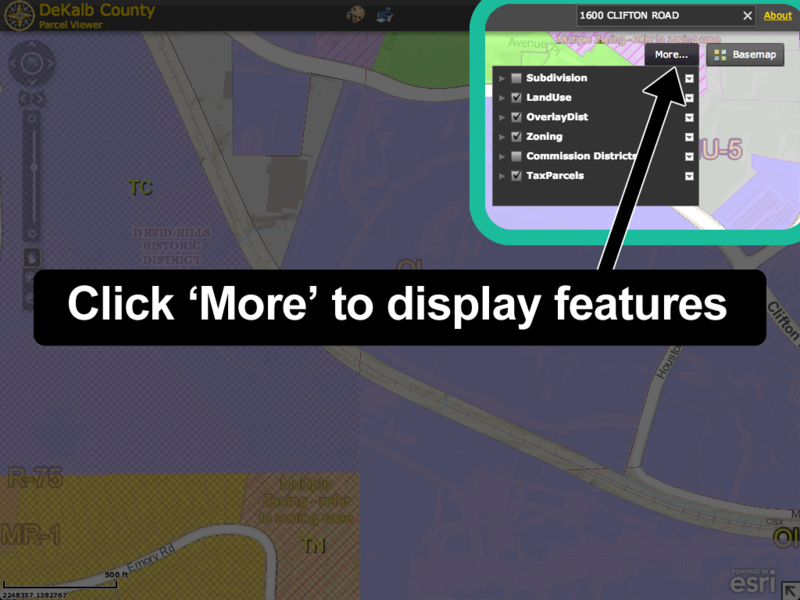 Make a note of all the zoning types, land use designations and other information. Learn why these are so important! While every property in DeKalb county is unique, each one is classified by a Zoning District and Land Use designation. These designations determine the general character of the property and include specific rules for what can be built. The way your property or neighborhood is zoned can greatly impact what kind of development can happen around you. It helps determine how dense it can be, outlines rules for building heights, buffersA portion of a lot set aside for open space and/or visual screening purposes. Buffers help separate different use districts, or to separate one property from another property. Traditional buffer... between properties and other important requirements. Each property in DeKalb County has a Zoning District type. The Zoning District is specific to a single property and determines several things, such as allowed uses, lot size and density limitations. Each zoning district also includes specific rules for the property, such as setbackThe distance which a building is set back from a property line, street or road, a river or stream, or any other place which is deemed to need protection. Not to be confused with a Buffer. requirements, bufferA portion of a lot set aside for open space and/or visual screening purposes. Buffers help separate different use districts, or to separate one property from another property. Traditional buffer... size and building heights. Land Use designations are not specific to a single property, but instead cover an entire neighborhood, city block or region. It’s a general description of a large area that determines its character (such as Suburban or Industrial). Only certain Zoning Districts are allowed in each Land Use category. For example: R-75 (a standard single-family home) is allowed in a Suburban land use, but not allowed in the Town Center category. Each property in DeKalb County has a Zoning District type. The Zoning District is specific to a single property and determines several things, such as allowed uses, lot size and density limitations. Each zoning district also includes specific rules for the property, such as setback requirements, buffer size and building heights. How does your neighborhood fit into the comprehensive plan? Along with the typical Zoning types and Land Use designations, sometimes a neighborhood can be included in a larger plan. Learn about the common types of long-range plans and how they can affect zoning around you. A Compatible Use Overlay District, otherwise known simply as an Overlay District, is a type of broad zoning that covers not just one property, but ‘overlays’ atop several different properties. An overlay can stretch for miles down a road or corridor. The purpose of an Overlay District is to encourage new development, enhance long-term growth and defines ‘compatible uses’, or allowed types of businesses to come in. An Overlay also contains design guidelines to regulate signage, architecture, landscaping and other details that may affect the appearance of an area. 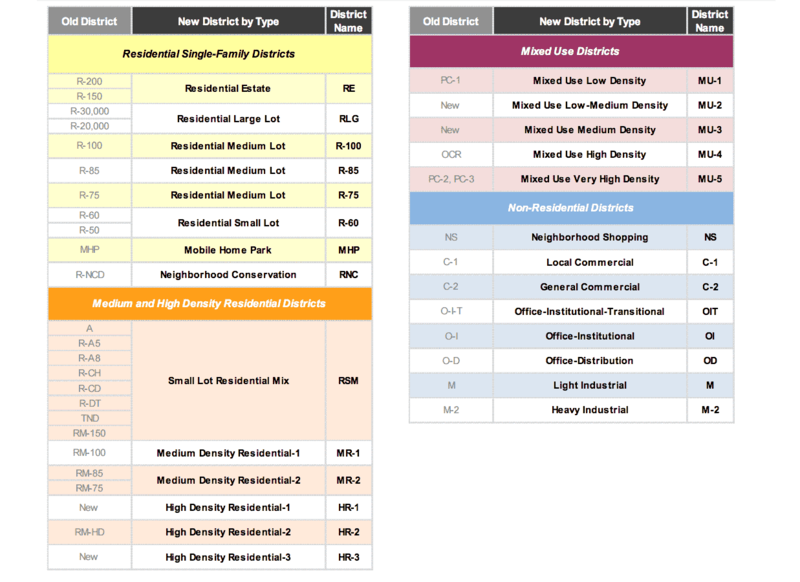 Similar to a Compatible Use Overlay District, a Historic District is “overlaid” on top of existing zoning types in a community. A Historic District, however, only defines historic character or aesthetic values and does not apply to how land is used. DeKalb County has a Historic Preservation Commission that deals specifically with the appearance of the district, using design guidelines to protect visual qualities of the district that reflect the history and heritage of that community. A Livable Centers Initiative or LCI is a long-range study created by the Atlanta Regional CommissionThe Atlanta Regional Commission (ARC) is the regional planning and intergovernmental coordination agency for the 10-county area including Cherokee, Clayton, Cobb, DeKalb, Douglas, Fayette, Fulton, Gwi... More (ARCThe Atlanta Regional Commission (ARC) is the regional planning and intergovernmental coordination agency for the 10-county area including Cherokee, Clayton, Cobb, DeKalb, Douglas, Fayette, Fulton, Gwi... More). The LCI program is designed to promote greater livability, mobility and development alternatives in existing areas. Regional planners have found when you focus density into one area that has sufficient infrastructure, you reduce the amount of ‘urban sprawl’ that we’ve seen in past years. LCI designs usually promote walkability, reducing vehicle miles traveled and the air pollution associated with those miles. The designs can also allow mixed-use and mixed-income developments, which provides a variety of housing options for different demographics. A Transit-Oriented Development (TOD) is a set of development guidelines adopted by the Metropolitan Atlanta Rapid Transit Authority, otherwise known in Atlanta as MARTA. These TOD’s focus on vibrant, pedestrian-friendly communities that are genuinely integrated with mass-transit. Many TOD’s in DeKalb County are compact, mixed-use neighborhoods located at or near a MARTA train station, but they don’t always have to be though. The Atlanta Beltline is a great example of a successful TOD even though it’s not directly MARTA focused. This may sound simple, but getting to know the people who live around you is an easy and effective way of learning about your neighborhood. Folks that have lived in the area for a while can be a wealth of information when it comes to historical data, land and property analysis & previous development and zoning info. Meaningful growth can be impacted by lessons of the past. Learning from mistakes, figuring out what worked previously and what hasn’t can act as valuable insight and also be a real time saver. Talk to your neighbors, ask questions and maybe you can learn a little piece of history! Get the conversation started planning a neighborhood meeting, join a community-focused forum such as Nextdoor or consider starting a Neighborhood Watch program! PlanningYourDeKalb.com provides information and assistance to the citizens of Unincorporated DeKalb County, Georgia in an effort to educate them and enable them to more effectively advocate for themselves and their neighborhood during the planning and zoning process. > Who is my DeKalb County Commissioner? > When & where are the zoning meetings? > What questions should I ask? > Register to vote today! • Have something you'd like to share? 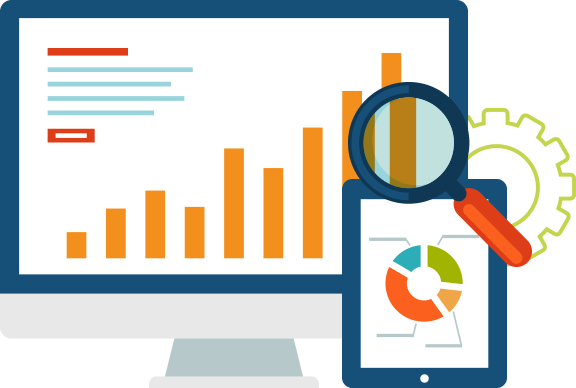 • See inaccurate or incomplete information? • Have a critique or a thought? Send it to us and we'll share it with our neighbors. We're constantly updating our site and need your input! This website is designed for general information only. We are not a law firm or realtor and are not a substitute for professional advice.